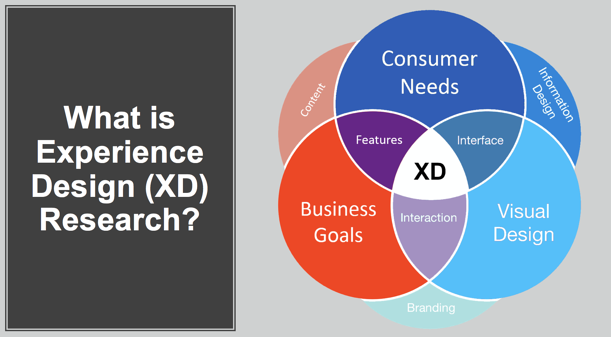 XD research, as illustrated in the image below, encompasses a wide range of activities, bringing them together to provide a holistic, all-encompassing experience to customers. XD research took off thanks to airplane design. Early airplanes crashed more regularly than they do today. Seeking a way to build a safer aerospace transportation vessel, companies started designing cockpits with the pilots’ physical limitations around reach and their ability to perceive things in mind. A vital lever, for example, might have been out of a pilot’s line of sight in the first airplanes. Thanks to XD research, they were able to create cockpits that catered specifically to a pilot’s in-flight behaviors and needs—building a much safer airplane along the way. Over the last several years, XD research has changed dramatically thanks to Agile principles and the development of new research technologies. Qualitative research platforms like Digsite, for example, enable teams to uncover the precise information they’re looking for through research sprints that allow researchers to capture consumer experiences through "unmoderated" online activities that participants complete on their own time, as well as live online discussions. These approaches to research can take a lot less time and cost a lot less money due to technology enabled recruiting, engagement, and reporting. Test early and often. It's much harder to evolve the design of a product without understanding the nuances of how people are going to use it. You don’t have to do anything major here—sketches on a cocktail napkin might even suffice. Take an initial idea to customers and ask for feedback. Use that feedback to inform your next iteration. Test the riskiest assumptions. Find out the answers to whatever your development team is unsure of as quickly as you can, rather than trying to scope a larger study that answers all of your questions. The earlier in the process you resolve shortcomings, the faster you’ll be able to bring a well-received product to market. Make it tangible. Some people have a hard time talking about things in the abstract. Give research participants a physical task to do to spark their imagination and encourage more detailed feedback. Ground the research in do not just say. Don’t just talk about products. Making participants physically do something that helps them remember the context of how they would interact with your solution opens up parts of the memory that would otherwise stay dormant. Start with qualitative to understand the what and the why. Keep drilling down to find out why customers think and feel the way they do. What may seem like a throwaway comment might actually be the profound insight you’re looking to uncover. Validate qualitative with quantitative. Once you’ve done enough qualitative iterations that consumers understand and value your solution, validate your research with a larger sample size. That way, you can gauge whether your findings were a fluke or you can confirm their merits, without wasting time and money testing a "guess". Now let’s turn our attention toward a real-world example to see how this might look like in action. Here are three examples of how American Family Insurance, a leading insurance provider in the United States, used agile XD research to strengthen their website, products, and direct mail marketing materials. For the first audience, they conducted phone interviews with customers who used agents to buy insurance. But for the other two audiences, the company used A/B testing to funnel a small subset of visitors from its regular website to a test website. This allowed them to see if that web visitor would try to purchase insurance online. If they clicked to buy online, they were told this feature wasn't available and were directed to talk to an agent. While this wasn't an ideal user experience, it allowed them to see what percentage of their web visitors wanted to buy online. They also conducted some "unmoderated" online research where they were able to share some early prototypes of what that online purchase experience might be like. Participants were able to share their expectations, simulate the shopping experience with web prototypes, and provide feedback and ideas for improvements. After several iterations with many different website configurations, they were able to create a web experience that delivered a great online shopping experience. The company also wanted to take a unique set of insurance features and bundle them together to create a new product. They talked to an online customer community to find out their level of interest, and exactly what the insurance offering should include. The questions were grounded in actual behavior. "How are you buying insurance now?" "What else have you tried?" "What worked and what didn’t?" Asking "what if" questions sparks imagination about what could change. Once they had a rough idea of the product, they did some quick remote testing using an "unmoderated" test where consumers were able to see some early ideas. They started with several concept boards, and worked their way to prototypes of what the online buying experience product might be. Once they had a solid idea of what they thought would work, they followed up with quantitative testing to determine size of prize and final feature set. AmFam also wanted to learn how people interacted with several direct mail pieces to maximize response rates. Instead of doing in-field testing—an expensive and time-consuming process—the company ran an online test to simulate and observe what customers would do with the mailers if they received them at home. They used methods like the "5 second test" to show consumers the contents for a short burst to see what they learned first. Then they dug deeper to answer questions like "Did customers understand the packaging?" "Does the envelope open easily?" "Is the messaging coming through?" "Are customers responding to the color and imagery?" After a few rounds of iteration, the company ended up making some minor changes to their packaging and enjoyed better results. Be willing to show low-fidelity prototypes. Your first idea won’t be your final one. Don’t spend so much time on your original prototype because you’ll be refining it through iterations. Plan for multiple study cycles as the concepts develop. Continue researching and iterating based on what you learn. Build several, fast iterations rather than one large study with only a single consumer touch point. Ground the researching in doing—not saying. When people physically interact with prototypes or share the context of their current behavior, they think about your concepts differently. Some people can’t think in the abstract. Relate research to risk. Find the answers to the questions that will have the biggest impact on your direction first. Those answers will inform your next set of questions. The graphic below illustrates five guiding principles to keep in mind as you apply new online tools and technology to your XD or consumer insights research. Believe it or not, getting started with on online research tools isn’t as hard as it might sound. 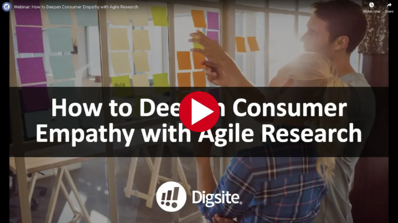 To learn more about how your team can innovate with agile research technology, check out this recorded webinar hosted by Digsite CEO Monika Wingate. Monika Wingate is the CEO of Digsite a leading agile qualitative research technology makes it faster for teams to learn from and iterate with consumers. She has more than 20 years of marketing, innovation and market research experience, including positions at General Mills, Pillsbury, and the A.C. Nielsen Center for Marketing Research at University of Wisconsin-Madison. She is a frequent speaker and regular blogger on research topics.